Craig Levein believes Harry Cochrane and Anthony McDonald can go on to play in the English Premier League. The Hearts manager was full of praise for McDonald after the 16-year-old’s performance against St Johnstone in the Scottish Cup at the weekend, while Levein has hailed Cochrane, also 16, for his performances in the Hearts first team. And Levein has tipped the pair to emulate former Hamilton Accies midfielders James McArthur and James McCarthy and make the step up to the English top flight. Speaking after Hearts’ 3-0 win over the McDiarmid Park side on Saturday, Levein told the BBC: “Every time [McDonald] got the ball, I felt excited myself. He is just going to be really, really good. McCarthy and McArthur both left Hamilton in 2009 and 2010 respectively, aged joining Wigan Athletic where they both played a part in the 2013 FA Cup win over Manchester City. 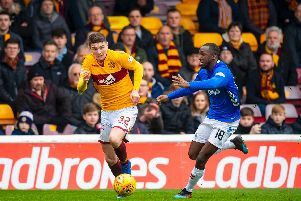 The pair now ply their trade for Everton and Crystal Palace respectively in the English Premier League, and Levein reckons McDonald and Cochrane have got what it takes to follow a similar career path. He added: “The last couple of players to do it were the two Hamilton lads who ended up going down to England at 19 or 20 – and that was having played most of their games in the First Division. “They (Cochrane and McDonald) have both got big futures ahead of them. The good thing is they are both lovely kids who are very grounded.